Steve Brown, Professor of Social and Organisational Psychology, School of Management, University of Leicester. The term ‘false memory’ has a complex history. 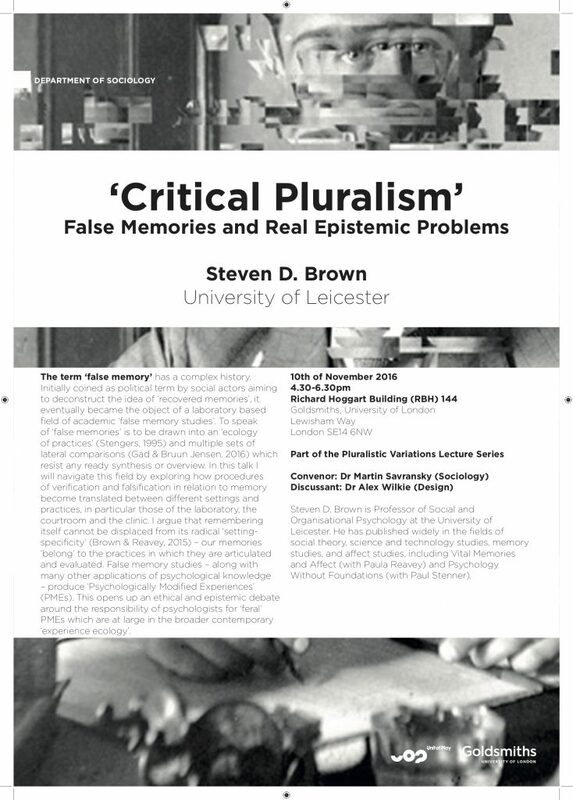 Initially coined as political term by social actors aiming to deconstruct the idea of ‘recovered memories’, it eventually became the object of a laboratory based field of academic ‘false memory studies’. To speak of ‘false memories’ is to be drawn into an ‘ecology of practices’ (Stengers, 1995) and multiple sets of lateral comparisons (Gad & Bruun Jensen, 2016) which resist any ready synthesis or overview. In this talk I will navigate this field by exploring how procedures of verification and falsification in relation to memory become translated between different settings and practices, in particular those of the laboratory, the courtroom and the clinic. I argue that remembering itself cannot be displaced from its radical ‘setting-specificity’ (Brown & Reavey, 2015) – our memories ‘belong’ to the practices in which they are articulated and evaluated. False memory studies – along with many other applications of psychological knowledge – produce ‘Psychologically Modified Experiences’ (PMEs). This open up an ethical and epistemic debate around the responsibility of psychologists for ‘feral’ PMEs which are at large in the broader contemporary ‘experience ecology’.